Ciprofloxacin is the generic international name for the synthetic antibiotic manufactured and sold by Bayer A.G. under the brand names Cipro, Ciproxin and Ciprobay (and other brand names in other markets, e.g. Veterinary medicine), belonging to a group called fluoroquinolones. Ciprofloxacin is bacteriocidal. Its mode of action depends upon blocking bacterial DNA replication by binding itself to an enzyme called DNA gyrase, thereby causing double-stranded breaks in the bacterial choromosome. Ciprofloxacin is a broad-spectrum antibiotic that is active against both Gram-positive and Gram-negative bacteria. It functions by inhibiting DNA gyrase, a type II topoisomerase, which is an enzyme necessary to separate replicated DNA, thereby inhibiting cell division. The major adverse effect seen with use is gastrointestinal irritation, common with many antibiotics. Because of its general safety, potency and broad spectrum activity, ciprofloxacin was initially reserved as a drug of last resort for use on difficult and antibiotic-resistant infections. As with any antibiotic, however, increasing time and usage has led to an increase in ciprofloxacin-resistant infections, mainly in the hospital setting. Also implicated in the rise of resistant bacteria is the use of lower-cost, less potent fluoroquinolones, and the widespread addition of ciprofloxacin and other antibiotics to the feed of farm animals, which leads to greater and more rapid weight gain, for reasons which are not clear. In cell culture it is used to treat infection with mycoplasma. The drug is available for oral, parenteral and topical use. It is used in lower respiratory infections (pneumonias), urinary tract infections, STDs, septicemias, Legionellosis and atypical Mycobacteria. Dosage in Respiratory tract infection is 500-1500 mg a day in 2 doses. It is contraindicated in children (except for serious infections and anthrax post-exposure), pregnancy, and in patients with epilepsy. Dose adjustment or avoidance may be necessary with liver or renal failure. Ciprofloxacin can cause photosensitivity reactions and can elevate plasma theophylline levels to toxic values. It can also cause constipation and sensitivity to caffeine. Ciprofloxacin is also known to cause swelling of joints and cartilage, and cause tendon rupture and chronic pain. 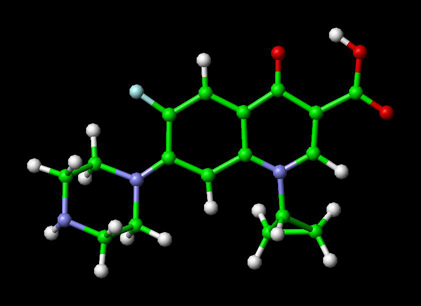 Quercetin, a flavonoid occasionally used as a dietary supplement may interact with fluoroquinolones, as quercetin competitively binds to bacterial DNA gyrase. Some foods such as garlic and apples contain high levels of quercetin. Whether this inhibits or enhances the effect of fluoroquinolones is not entirely clear. In 2005 the FDA changed the package insert for Cipro  to acknowledge the tendon ruptures and the development of irreversible neurological conditions. The incidence of side effects for ciprofloxacin is acceptable and relatively safe. Approximately 9% of patients taking the medication experience side effects ranging from mild to moderate, with the vast majority of those relating to metabolic-nutritional problems and the central nervous system. Compared to other Fluoroquinolones the incidence and severity of side effects from ciprofloxacin is low. The discovery and development of ciprofloxacin opened up a new class of antibiotics for further research, development, and marketing. Bayer Pharmaceutical embarked on a plan to remake itself from a pharmaceutical manufacturer into a player in the international pharmaceutical business, with a lock on the antibiotic field. Unfortunately, a combination of the tendency for antibiotics to be viewed as a commodity and prescribed on the basis of lowest cost, Bayer's inability to follow up with another 'blockbuster' discovery, and a general downturn in the international pharmaceutical business forced Bayer into a major downsizing in 2000-2001. Faced with the imminent expiry of its patent rights to ciprofloxacin in the early 2000s and the loss of market share to generic ciprofloxacin, Bayer has focused on the development and patenting of new variations of the existing drug (i.e. pediatric ciprofloxacin, intravenous ciprofloxacin, once-a-day ciprofloxacin, etc. ), which will provide new patents and new sources of revenue as patients move to these newer versions of ciprofloxacin. "Cipro" became a household word during the 2001 anthrax attacks. Generic ciprofloxacin is now available in many markets around the world including the USA. In addition two new once daily formulations have been launched in the USA. Bayer have marketed Cipro XRÂ® which is an extended release formulation. Meanwhile Depomed have developed ProQuin XRÂ® another once daily formulation of ciprofloxacin which uses a gastric retention polymer technology to slow the release of ciprofloxacin into the blood. Drusano GL, Standiford HC, Plaisance K, Forrest A, Leslie J, Caldwell J. Absolute oral bioavailability of ciprofloxacin. Antimicrob Agents Chemother 1986;30:444-6. PMID 3777908. Hilliard JJ, Krause HM, Bernstein JI, Fernandez JA, Nguyen V, Ohemeng KA, Barrett JF. 'A comparison of active site binding of 4-quinolones and novel flavone gyrase inhibitors to DNA gyrase. Adv Exp Med Biol. 1995;390:59-69. PMID 8718602. Spivey JM, Cummings DM, Pierson NR. Failure of prostatitis treatment secondary to probable ciprofloxacin-sucralfate drug interaction. Pharmacotherapy 1996;16:314-6. PMID 8820479. Brouwers JR. Drug interactions with quinolone antibacterials. Drug Saf 1992;7:268-81. PMID 1524699. Cipro package insert. Page 7 Warning of tendon ruptures and irreversible neurological conditions. Schacht P. (1989). Safety of oral ciprofloxacin. An update based on clinical trial results. American Journal of Medicine: Nov 30;87(5A):98S-102S. Fluoroquinolone-Induced Tendinopathy: What do we know? Richard M. Harrell, MD.